As Aircraft and Engine components wear down, usually prematurely, the parent assembly have to be detached and replaced with new components to return the equipment to service. "New Replacement" aviation parts are usually expensive and have lead times on delivery forcing us to store expensive aircraft replacement parts or remain idle and wait for delivery. Another option aside from "new replacement" is to fix or repair the damaged or worn part to best standards and lead time. We set great importance on aircraft component repair and in response to this have partnered global technology leader in developing a network of centers of superiority. Our exclusive partnership with KRAUSS GmbH Aviation Technologies and KRAUSS (China) Aviation Technologies Co. Ltd. the leading aircraft parts repair stations with facilities in Germany, China and Brazil allows us to offer a range of repair capability to compliment our services. This also enables us to meet your demands for higher yields thus sharing our depth of expertise to help you succeed. We offer part or component repair capabilities for aircraft engines, APUs, Landing Gears and airframe parts. For all these product groups a release certificate in accordance with EASA Form-One. For land-based industrial gas turbines a Certificate of Conformity in accordance with DIN EN 10204 can be issued. The Repair Station is certified by the European air agency capable of repairing parts from aircraft engines and APUs (all types) and Landing Gears (all Fokker-types) as well as airframe components (Boeing). SNECMA. „Source approved" repairs may be performed on request. APU Parts - Components from all P&W APUs can be repaired. Airframe Parts - Components from all Boeing-Types can be repaired. Landing Gear Parts - Components from Fokker & Embraer-Types can be repaired. Please click on this link Repair Capability Parts List for detailed list. New repairs are continuously being developed to increase yield and reduce maintenance costs. Gives you the flexibility to choose the best way to economize on component maintenance costs while achieving optimum parts availability. Thermal Spray - coating processes in which melted (or heated) materials are sprayed onto a surface. Electrochemical Plating - Metallizing or stripping of functional surface coatings, either partially or completely from steels, austenitic steels, nonferrous metals and Ni-,Co-materials. Peening and Blasting - Process blasting is used to clean surfaces, prepare them for other processes or to density the surface structure. Painting - Organic or inorganic coatings are used for corrosion- or wear-protection. Welding - Joining or build-up of material by application of heat and/or pressure with or without filler material. 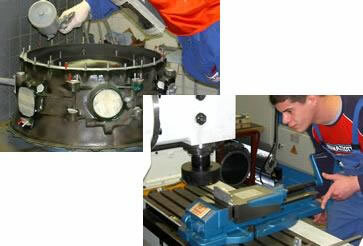 Mechanical Pre- and Final Machining - The components to be repaired are usually pre-machined. After the coating process they are machined to the final dimension. NDT - Non-destructive test methods are utilized to inspect components during and after a repair process for absence of cracks or other damages.